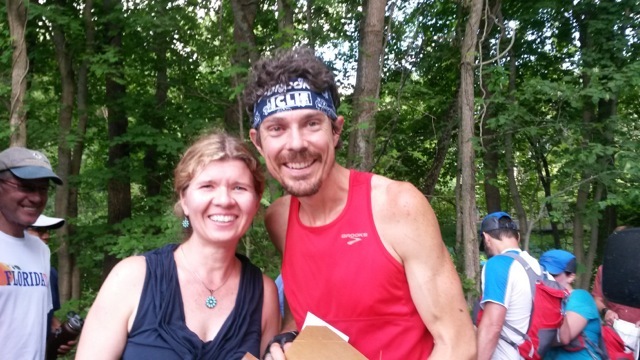 My friend Sara and Scott Jurek with his support crew in Sheffield. 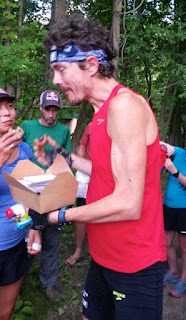 Scott Jurek is running the Appalachian Trail, trying to break the speed record made by Jennifer Pharr-Davis in 2011 of 46 days, 11 hours and 20 minutes. His plan was to run 50 miles a day for 42 days. Can you imagine? That's almost two marathons everyday for 7 weeks. It is grueling. A friend of mine, Sara, has followed his running for years and loves his book, Eat and Run, part autobiographical and part vegan cookbook. She wanted to meet him as he ran through the Berkshires. So we followed his Facebook page and his Delorme tracker and went out to find him. 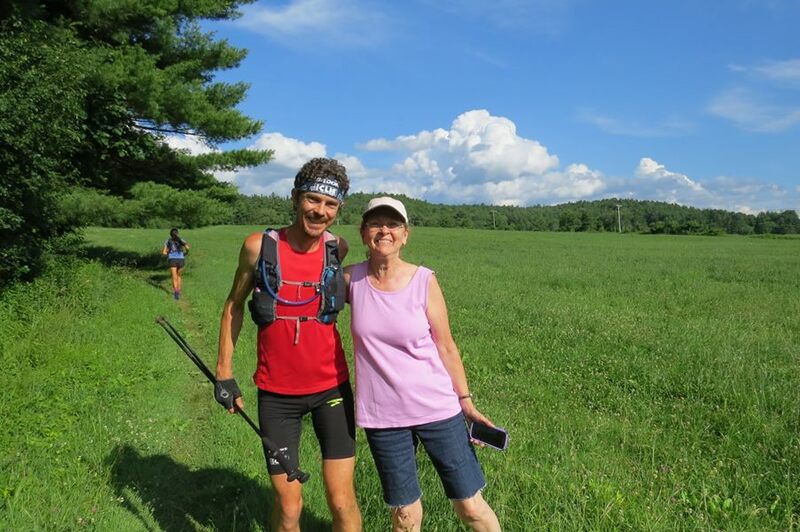 The trail crosses various roads here in southern Berkshire county, so we finally found him running with his wife along the trail in Sheffield. We said hello and got a few photos and then went to find his support crew at the Housatonic River. There we met his crew of runner friends who are coaching him and taking turns running with him as does his wife sometimes. She is also a long-distance runner. Sara had baked Scott some vegan muffins. When he came running up, he first conferred with his crew, then thanked her for the muffins and we got a few more photos. After eating one and restocking with water he was on his way again. I enjoyed meeting Scott, his wife Jenny, and his crew, and wish him good luck in his run to Mount Katahdin. UPDATE: Yesterday, Sunday, July12 at 2:03pm, Scott finished the trail at the top of Mt. Katahdin in Maine. His time: 46 days, 8 hours, and 7 minutes. He broke the record by over three hours. Wow is that close! He was nice enough to stop for a photo with me while his wife Jenny ran on ahead.